The king of social media “Facebook” is faceless !! I have been on Facebook since 2009, and an active user since 2012. I probably started being an even more active user from 2015 onwards because we started our ShikshaDaan Yatra and the new ShikshaDaan website got launched which tracked our Yatra using the “Facebook” check-in feature. Everything was going well except for the fact that the posts on ShikshaDaan’s page would not reach enough people…. Facebook would ask for some money to be paid to boost the reach and even after paying, the reach didn’t go too far ! On Jan 2nd, 2017 I posted an event and tagged my friends to invite them for that event. The event was the Cooptex “Festive Weaves” exhibition being held in Gurgaon on the 21st of Jan. Well, Facebook had a famous “glitch” and that post got replicated on my timeline some 19 times and on the timelines of the people I had tagged, it replicated several times, daily. Initially it was a joke and I simply posted a witty statement saying “please bear with me”. I tried deleting the post, I tried removing the tagged names and I posted a complaint three times to the Facebook helpdesk – NOTHING happened. One of my friends, unfriended me and befriended me (thank God)… and I dont know how many friends unfriended me and never befriended me again on Facebook atleast :(. Its amusing initially but extremely annoying and really unacceptable. 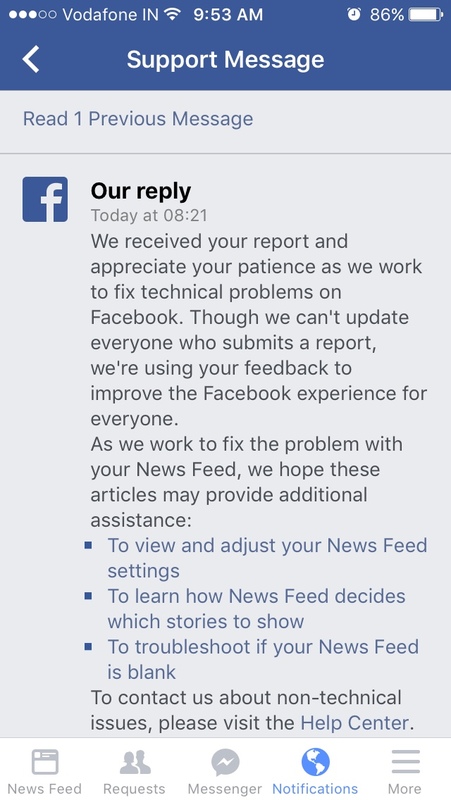 I complained on Jan 5th and then on the 7th and then again on the 10th… I got an inane generic reply from Facebook’s customer service team on the 15th for my complaint on the 5th saying they cannot reply individually to each complaint !! Seriously ?? This is the “king” of social media unable to respond to a complaint? then why allow complaints? Well, Mr. Zuckerberg, the current Indian Govt responds faster than this !!! I complained about ShikshaDaan not receiving the 12A and 80G exemptions and got a response within the promised 45 days. I order the gas cylinder refill and we had to travel out of town… Krishnan posted a request for delay and we promptly got a response saying the cylinder will be delivered on the requested date. And yes, the cylinder got delivered on that date. That is “customer service”, not the kind that you seem to have ! Even more upsetting was getting the same response for my second complaint made two days later and both the complaints got closed – no resolution, but you closed the issues – WOWWWWW. And am guessing I won’t get any response for my third complaint because I asked if there was anyone at Facebook who understands customer service … that wouldn’t have pleased your folks in any way. Has the problem of the replicating post been sorted out – please provide a cogent answer, not a canned inane response. Why doesn’t the ShikshaDaan page post to our respective timelines (Bindu and Krishnan) inspite of tagging each other ! ShikshaDaan is a not-for-profit organization, so why do you want us to pay to boost the reach ??? Please take a one time payment and let the readers decide if they are interested in our cause or not. A question in general to all companies – is your customer service “faceless” ? I know the banks (all national and international banks) have a faceless, care-less, opaque customer service team – the only opening you have is if a particular branch has a great manager, then you have a chance of getting your issue sorted. If you get into the tele support maze … you shall not get any human being on the other side. So, look into your own customer service organizations and figure out if they are indeed faceless. We don’t need more options on the IVR (interactive voice response) menu, we need to speak to someone who doesn’t put customers on an “IV” (intravenous) drip. Menus don’t solve anything, human beings do. In the meantime – any face in Facebook is welcome to help resolve the above two issues ! देशवासियों, मद्रासियों से सीखो !! Not surprising to see this and I have faced this with Linkedin as welll. Any solution Tabrez? I wasn’t happy with FB’s response.